First published in The Adelaide Review. Daisy Bates, or Kabbarli (grandmother) as her ‘natives’ called her, is best remembered as an eccentric Edwardian, done up in a white blouse, stiff collar and ribbon tie; a dark skirt, sailor hat and fly-veil. Bates always maintained a ‘fastidious toilet … to the simple but exact dictates of fashion as I left it when Victoria was Queen’. Most people would visualise her waiting for the train at Ooldea Siding, or back at Yooldilya gabbi (Ooldea Soak), bringing her warmth, charity and strong, healing hands to the local Wirangu people. The inimitable Bates lived alone in a tent with her collection of Dickens novels, in this inhospitable chunk of desert, 190 kilometres north of Fowler’s Bay, from 1919 until 1935. Many of us might not realise that Daisy May O’ Dwyer, once-time wife of the almost-as-infamous Harry ‘Breaker’ Morant, was just as comfortable walking the streets of Adelaide as trawling the desert for young Aboriginal girls to mother. 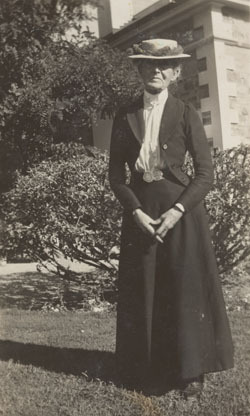 Bates, like many of the grand figures of Australian history (read Percy Grainger), was a mass of contradictions: conservative Edwardian and bigamist; ethnographer and shonky journalist (in 1908 she met a group of Aboriginal women in the Murchison district, every one of which, she claimed ‘… killed and ate her newborn baby, sharing it with every other woman in her group’); inspiring (an outback proto-feminist) but, in the end, sad; loving, but impossible to love. In her day, Bates was a major national figure. She was almost as well known as Don Bradman (who also came to live in Adelaide in the mid-thirties) and Phar Lap, Squizzy Taylor and Billy Hughes. Bates was the original Geraldine Cox, running a one-woman mission for a people who were, in her opinion, destined for extinction. Whereas Cox’s Sunrise Children’s Village is all about creating futures, Bates’ work was more about soothing the fatal wound of history. It seems she loved children. Her own son, Arnold Bates, was born in 1886. At the time, she was bigamously married to Jack Bates. Arnold fought in World War I and later moved to New Zealand. When Daisy attempted to contact him in 1949 he wanted nothing to do with her. Arnold realised he had always come a distant second to his mother’s ‘natives’. By January 1937, with her bank account overdrawn, and intending to research a new book, Bates moved to Pyap, near Loxton. She’d recently sent her collected articles to a London publisher, but on the way the plane had crashed into the sea. The bags were salvaged and the articles forwarded to John Murray, who eventually published them as The Passing of the Aborigines. Although out-of-print today (for obvious reasons), after appearing in 1938 this book was read and admired throughout the world, affirming Bates’ reputation as the authority on Australian Aborigines (although many disputed this). After years in the Riverland, and a mental and physical breakdown, Bates was hospitalised in Trent Hospital, South Terrace (St Andrew’s) in 1945. The old wanderlust soon kicked in and this time she went to live at Streaky Bay, hoping that she might run into some of her old wards. A friend, Beatrice Raine, invited her back to Adelaide in 1948 to share a house in the Hills. Bates was almost ninety, but showed no signs of slowing. Upon her return to the city she tried to contact her son in New Zealand. She had always carried a picture of him as a seven-year-old. When he refused to talk to her, Bates told a friend that ‘he must have lost his memory’. This, she convinced herself, was the only way to explain his rejection. But, according to a journalist who met Arnold Bates, he had no feeling for her or her ‘legend’ at all. By 1949 Bates had become the grand old dame of Adelaide again. She still dressed in her Edwardian finest, parading along King William Street. Cars would slow to look and kids would ask mums, ‘Is that Mrs Bates?’ On a good day, an Adelaidean might see the Don and Daisy in a single afternoon. Bates would often get lost, confused, and ask for directions. She’d wander onto roads and have to be helped, but no man or woman alive was about to tell Daisy she should be home beside the wireless. One day she stood outside Government House, demanding to see the Governor. To save everyone embarrassment, a local police woman, Alvis Brooks, convinced her that her car was the Governor’s own limousine, and Bates allowed her to drive her home. Over the following 18 months, Daisy moved to Torrens Park, and then St Margaret’s Convalescent Home at Semaphore and, finally, to a private hospital at Prospect where, on 19 April 1951, almost blind from sand blight, small, weak, but still proudly defiant and mentally sharp, she died. She was buried at North Road Cemetery with a sprig of desert pea on her coffin. It’s worth a visit: row 15S, plot 255B. Ironically, Daisy is hemmed in by the suburbs, nearby car yards and back yards full of washing flapping in the breeze. But, of course, she’s not. She’s still in her tent, reading David Copperfield, fixing cuts and grazes, helping her Aborigines. And for what other reason than a deep well of compassion and love? Sometimes, in our struggle to understand this complex woman, we lose track of this one simple truth. Tom Playford paid tribute to her, but didn’t think her worth a state funeral. Although born in County Tipperary, Ireland, Kabbarli made the desert, and the streets Adelaide, her home. For this, we should all be grateful.